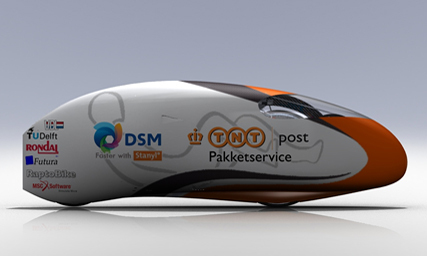 Bentrideronline has posted a message about one hour speed record of 91,556 km. The rider was Francesco Russo from Swiss and his bike Eiviestretto. The machine itself is pretty interesting as it was built in cooperation of Francesco and Demjan Zabovnik. Both of them have lot of experiences in building and riding very very very fast bikes. The story about the record can be found here and here we have a story about the bike iteslf which can be found on the same web page too. Well done Francesco and Demajn! 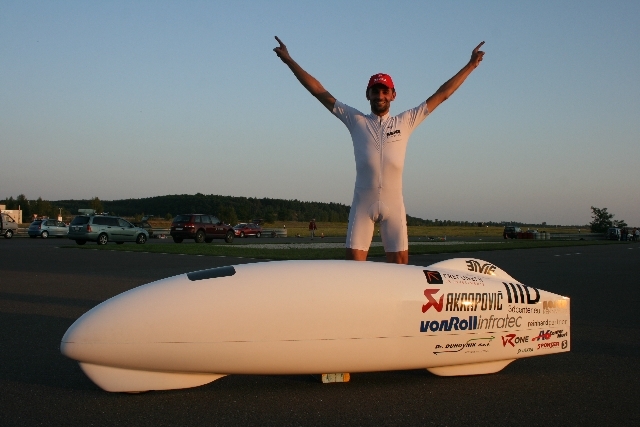 After the Dekra-Event 2010 Damjan Zabovnik and me joined together to build a streamliner and brake the One-Hour-World-Record. The result is a team who is very experienced in building and riding speedbikes. Exactly one year after our decision to go this way together I set the World Record. The Eiviestretto (Eivie + Ristretto) is based on Damjan Zabovnik’s Eivie III. So the rider goes backwards, head first and lying on his back, he uses a mirror for navigation. The shape is slightly modified, as I am taller and have longer legs than Damjan. We improved steering mechanism in cooperation with Leon Plestenjak (company 3D konstrukcije), to make more space for the helmet and head. I am very tight inside the vehicle, but I still can steer, breath and pedal normally. Tolerances are within milimeters. The transmission was also redesigned, using different configuration of bearings and better materials, so it provides more efficient power transfer to the rear – driving wheel. Front wheel – steering wheel has a shape of a plate and is not symmetrical, inside the front wheel are steering bearings, instead of the head tube above the wheel as by ordinary bikes. Eiviestretto also has no steering cables, but it has a push-rod instead.